After communism collapsed in the former Soviet Union, capitalism seemed to many observers like the only game in town, and questioning it became taboo for academic economists. But the financial crisis, chronic unemployment, and the inexorable rise of inequality have resurrected the question of whether there is a feasible and desirable alternative to capitalism. Against this backdrop of growing disenchantment, Giacomo Corneo presents a refreshingly antidogmatic review of economic systems, taking as his launching point a fictional argument between a daughter indignant about economic injustice and her father, a professor of economics. Is Capitalism Obsolete? begins when the daughter's angry complaints prompt her father to reply that capitalism cannot responsibly be abolished without an alternative in mind. He invites her on a tour of tried and proposed economic systems in which production and consumption obey noncapitalistic rules. These range from Plato's Republic to diverse modern models, including anarchic communism, central planning, and a stakeholder society. Some of these alternatives have considerable strengths. But daunting problems arise when the basic institutions of capitalism--markets and private property--are suppressed. Ultimately, the father argues, all serious counterproposals to capitalism fail to pass the test of economic feasibility. Then the story takes an unexpected turn. Father and daughter jointly come up with a proposal to gradually transform the current economic system so as to share prosperity and foster democratic participation. 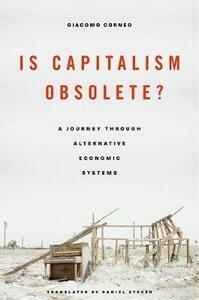 An exceptional combination of creativity and rigor, Is Capitalism Obsolete? is a sorely needed work about one of the core questions of our times.